Texts have powers. Many horror stories hinge on the idea of a secret and forbidden document, a dusty scroll or grime-smeared palimpsest that will, once read, turn any person utterly and irretrievably mad. For centuries this lost object was assumed to be just the strange fantasy of a few creepy, fevered men, a plot device for the greasy and morbid. But the world is far too cruel for the most horrifying things you can imagine to only be imaginary. In fact, this thing really exists. 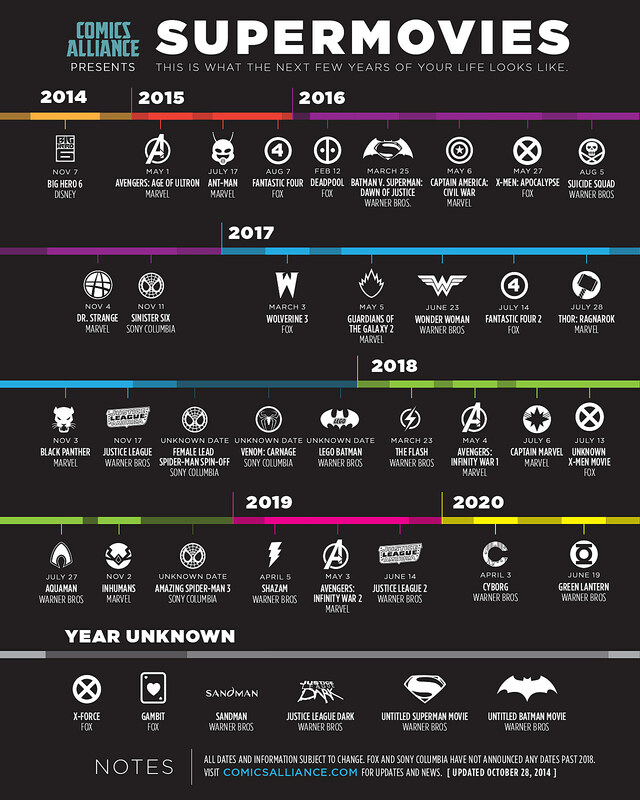 The thing is an image released by a site called ‘Comics Alliance’ that promises to reveal “what the next few years of your life looks like.” It fulfills this Sibylline promise by showing the release dates for upcoming superhero movies, to the day, up until 2020. Stare too long at this deranged map of the future and everything starts to make a horrible kind of sense. This is what philosophers like Adorno meant when they talked about the totally administered society. This is what the economists mean when they warn that we’ve invested more than one planet’s worth of resources in the current system. There’s a kind of machine-like finality to the thing, the sense of an absolute and irrevocable judgement. Put away any thoughts of a better world. Our course has been set. Your life has been planned for you, and you just live it. Avengers: Infinity War 2 will come out on the 3rd of May, 2019. Neither plagues nor meteorites nor nuclear war can stop the release of Fantastic Four 2. A film genre that has reached cultural dominance by endlessly imaging the apocalyptic destruction of cities and peoples is at the same time incapable of imagining that anything could ever actually change. “The disaster,” Blanchot writes, “ruins everything, all the while leaving everything intact. It does not touch anyone in particular.” Everyone knows that in Hollywood films, attempting to change reality is always the mark of demonic Evil; the role of the heroes is to keep everything exactly as it was. (In Avengers: Age of Ultron, for instance, the titular artificial intelligence goes from the quite accurate assessment that the Avengers are not really as good as they think they are, and that the world must be changed to be saved, to the conclusion that the best way to make this change is by blowing up the whole planet. His thought process here is never really explained; it’s just a necessity of the narrative. Hollywood gives us “complex” heroes who are never quite heroic enough only because it’s terrified of the idea that its villains might not actually be all that villainous.) Baddies act, heroes clean up the mess. This constant reversion to the status quo is an important propaganda function of the film, but it also serves a far more basic function: everything has to stay in some way the same, even if skyscrapers splinter and the oceans boil black, so that there can be a sequel. Of the twenty highest-grossing films of all time, only two — 1997’s Titanic and 2010’s Alice in Wonderlann — are not part of a sequel-based franchise. (And even those are based on texts and events that are now over a century old.) Something’s been lost, somewhere, some dream we once had — but the whole process just keeps on going, a cycle that repeats itself, over and again, propelled only by the lifeless weight of inertia. Every repetition is different, but underneath it’s always identical. As a weary planet churns slowly towards extinction, slowing with every cycle, it might be time to rethink what we mean by the disaster. Maybe the disaster isn’t the possibility that everything might suddenly, violently change. The disaster isn’t the asteroid impact or the hole torn in the sky. The disaster is what happens when everything stays exactly the same. It might not mean anything in this vast, flat, and indifferent field, but the most successful movie sequel of all time looks to be this year’s blockbuster Jurassic World. Perhaps for good reason. In a surge of blood and fury, Jurassic World marks the moment when the sequel-industrial complex gained sentience. Of course, another sequel’s already been announced, and so the meaning of this film will probably be snuffed out before long. But for one opening weekend, the culture revealed itself for what it really is: a roaring, deadly monstrosity, full of pain, fury, and suicide. Movie critics aren’t usually the brightest bunch, but they’ve still managed to pick up on what’s really important about this film. 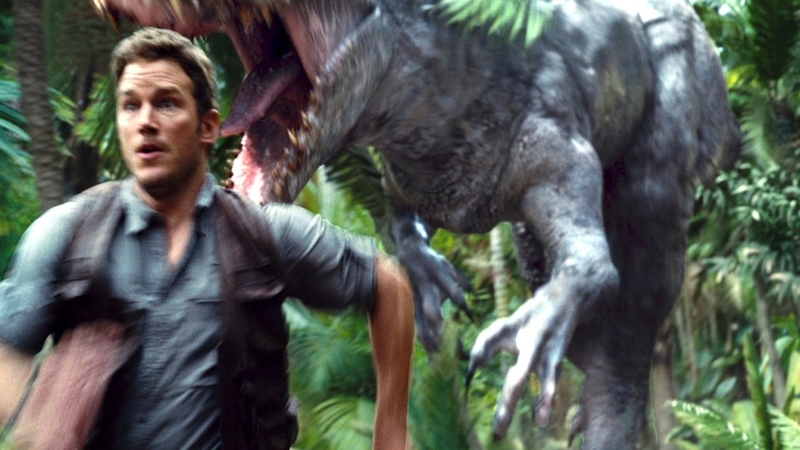 Jurassic World isn’t about dinosaurs; Jurassic World is about Jurassic World. The story goes like this: the theme park envisaged in the original film (1993’s groundbreaking Jurassic Park), the one where tourists can mingle with genetically engineered dinosaurs, has become a reality. On a tropical island in the middle of the sea, thousands of visitors swim in the lagoon, sip margaritas on rooftop bars, paddle kayaks downstream as stegosaurs and sauropods munch placidly on the succulent, overhanging foliage, and, by about the third day, grow utterly bored with the whole experience. The park just isn’t exciting people any more, and so its corporate owners decide to create an all-new monster: Indominus rex, something “bigger, louder, and with more teeth.” In other words, a pointless ramped-up sequel. As many of the island’s staff point out, creating a new dinosaur is a stupid and excessive gesture (one sneeringly suggests that they call it Pepsisaurus — and you have to wonder how much Pepsi contributed to prevent him saying Cocacolasaurus instead), and when the thing inevitably breaks loose, all those engineered traits that made it the perfect tourist attraction have also given it a disastrous efficiency for slaughter. Cue scenes of panic, as the visitors are mown down in anonymous masses by their own schlocky entertainment. Culture bites back. Much of the response to the film has essentially left it at that: it’s talking about itself, how postmodern, now let’s move on to the action sequences. But what does it mean when a cultural text is positioning itself as a ravenous chimera, as something that needs to be destroyed? Sometimes film nerds complain, improbably, that a sequel is retroactively “ruining” or “destroying” the original. Here this is directly acted out: the I-Rex kills every dinosaur it encounters, not for food or even for fun, but out of pure boundless malice. At the same time, sets and props from the old film (flare guns, Jeeps, and so on) are instrumental in helping our snotty heroes escape the carnage. And at the end, after the new dinosaur is defeated in a climactic final fight with a T-Rex and a Velociraptor (if you couldn’t work out from the concept of the film that the new dinosaur would be defeated in a climactic final fight with a T-Rex and a Velociraptor you should probably have looked away there), the two victors share a look of sympathetic recognition — something crude, cartoonish, and utterly monstrous; something that’s hideously, screen-shatteringly wrong — before retreating to their own enclosures. As the film keeps on reminding us, these aren’t dinosaurs, they’re genetically engineered simulations of dinosaurs; they, too, are in some way an abomination. If Jurassic Park was about the terror of humanity’s inability to control the vast, dark, blind powers of nature, Jurassic World is about the terror of humanity’s inability to control the vast, dark, blind powers of culture. We’re not on entirely unfamiliar ground. Jacques Derrida diagnoses the central dynamic of Jurassic World as mal d’archive, or archive fever. This concept emerges from his reading of Sigmund Freud’s Civilisation and Its Discontents: at a certain point, Freud becomes worried by the sense that he’s repeating himself, and that by putting these repetitions to print — by archiving them — he’s creating an excess that can only be monstrous. “In none of my previous writings,” he writes, “have I had so strong a feeling as now that what I am describing is common knowledge and that I am using up paper and ink and, in due course, the compositor’s and printer’s work and material in order to expound things which are, in fact, self-evident.” Inscription as repetition, the ceaseless recurrence of something already very familiar, is a blasphemy. The model here is of an economy, and writing of this kind isn’t production but expenditure; a stupid, needless waste of trees (or, as the case may be, celluloid and computing power). The only way the act of writing-archiving can be redeemed is if it introduces something new; something that acts counter to the always-archived nature of the text. Something that is not, and cannot be, “common knowledge.” And Freud does indeed introduce something like this: to justify itself, his text has to pivot itself around the dangerous concept of Todestrieb, or death-drive; the secret urge in the human psyche towards the destruction of the self, and with it, the entire Universe. Death-drive isn’t melancholy or suicide, but the fury of an ego unleashed against itself. An apocalypse in miniature. For psychoanalysis, death-drive is an interior desire whose ramifications are on the level of the personal and the societal; for Derrida, it has other, more foundational dimensions. Death-drive, which arrives in the nick of time to save all that ink and paper, has to be read in its relation to writing. The desire to annihilate everything is also a desire to annihilate the written archive. In Freud the death-drive always disguises itself as some form of libidinal impulse; Derrida notes that by adopting a sexual hue, “it leaves no monuments, it bequeaths no documents of its own.” Freud was notoriously reluctant to face the possibility of a psychological drive that tends not towards sexuality but towards death; it haunts the text of the Freudian canon from the outside, visible only by the deep scars its claws have left in its concrete enclosure. When finally articulated, it can rescue the archive only because it itself is radically different to the archive; self-destruction “will always have been archive-destroying, by its own silent vocation.” In other words, the only thing that can really justify the grand repositories of the written text is the possibility that it might all be destroyed. This is mal d’archive, the virus creeping like sliverfish through the structure of thought and history: culture’s secret desire to extinguish itself. Archive fever works within the archive; this is why so many writers seem so pessimistic about the intrinsic value of writing. Chaucer ends the Canterbury Tales with a Retraction in which he effectively disowns his entire life’s work, while Shakespeare spends most of his plays abjuring language altogether. As Beckett puts it, “every word is like an unnecessary stain on silence and nothingness.” Jurassic World is a bleakly, defiantly Beckettian text. The Indominus rex is a brutal, sadistic, destructive creature, and supposedly the villain of the piece, but this film is always secretly on its side. How could it not be? The I-Rex is the film. This is what allows the film to carry out another distinctly Derridean manoeuvre: it manages to survive its own death. The rampaging I-Rex is killed, but the screen doesn’t then immediately cut to black. Instead there’s that glance between the hideously artificial dinosaurs. Even after the new dinosaur dies, its logic and its victory remain. This sudden truce or emergent dinosaurian Utopia is, as a filmic artifice, a grotesque obscenity. It must be destroyed. (No doubt it will be, when Jurassic World 2 arrives.) This film demands the burning of all films, the bulldozing of libraries, mobs slashing paintings with razors, bearded philistines taking sledgehammers to ancient ruins. It begs for disaster. Jurassic World wants to save culture — but for this to happen, first there must be the possibility of annihilation.